Several years ago, I bought a used copy of the NES game BattleToads to add to my video game collection. I noticed when I bought it that it had a name and address scrawled on the back in permanent marker, which was barely legible. The clearest part of the text was the first name, Zac. I didn't give it much thought, cleaned the game, tested it, and put it on the shelf with all of my other NES games. Occasionally I'd play it, and I'd always notice the name and address again, and gradually my curiosity about Zac increased. It was a little mystery in my life that I just couldn't let go of. Who is Zac? How did this copy of BattleToads come to be his, and how did he lose it? I've decided that I want to find Zac. I want Zac to know that his copy of BattleToads is safe and sound, in a video game collection that is taken care of, played, and enjoyed. I realize that the odds are long. Most of the address is very difficult to read. The chances of Zac or anybody who knows Zac seeing this are almost zero. And yet, I still have to try. I'm crazy like that. 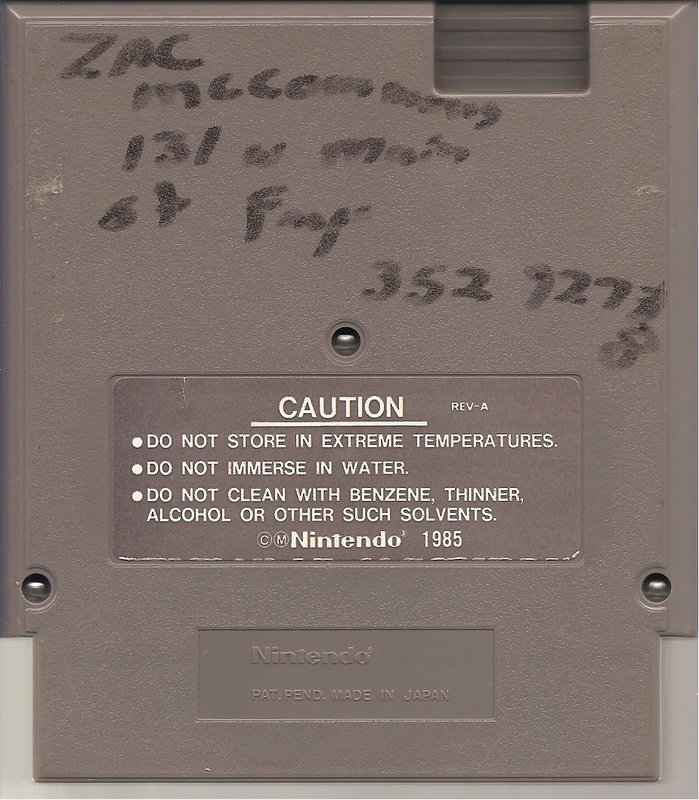 Zac's last name appears to be McCormick, McCarthy, or something similar. The address looks like 131 W Main St. I believe the city is Fargo, although that's entirely up to interpretation. I looked up 131 West Main Street Fargo ND on google maps and the address is kind of legitimate (there is a Main Avenue rather than a Main Street), although it does not appear to be a residential area. The phone number has no area code, and begins with 352 (I also tried to determine whether this is a Fargo number, but I'm not sure). My best guess at the last four digits of the phone number are 9278, although they're pretty difficult to read. If you liked this blog entry, you may also enjoy Highlights From the First Issue of Nintendo Power.